Japanese Episode AG 007: "Kimori no Mori! Kyodai Ju o Mamore!!" American Episode 279: "Tree's a Crowd"
Satoshi-tachi are still lost in the Forest of Touka when they spot a Kimori. Satoshi tries to capture the grass-type pokemon, but it is able to get away. After chasing the pokemon, Satoshi-tachi come across a colossal tree where a whole bunch of Kimori are gathered. It turns out that the Kimori that Satoshi had been chasing wants to stay behind to protect the dying tree, but the other Kimori want it to simply move on to a newer, healthier tree. Pikachu convinces Satoshi to stay behind and help the Kimori take care of the tree, so Haruka and the others leave him to return to their camp. Satoshi uses his actions to prove to the Kimori that he's on its side, and all seems to be going well until the Rocket-Dan appear to kidnap all the forest's Kimori. The Kimori Satoshi had wanted to capture attacks the Rocket-Dan's balloon, defeating the group of thieves while rescuing its friends. 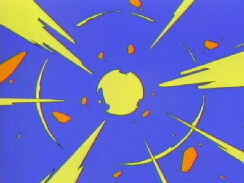 However, no sooner do they blast off does the colossal tree crack and break in two! The old tree is now dead, but a seedling dropped from the tree brings the promise of a new life. Meanwhile, Kimori challenges Satoshi to a duel, and after Pikachu shocks it with a Thunder attack, Satoshi captures the gecko pokemon. Now Satoshi has two Houen region pokemon and continues on his path to the next gym. Anyway, today Satoshi gets his newest pokemon, Kimori. I think it's nice that the anime writers are spreading out the starter pokemon among the group's three trainers instead of giving them all to Satoshi, who probably would have just let the other two kinda just sit and rot anyway. 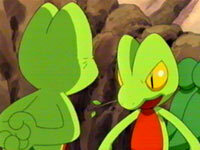 And you have to admit, Kimori is just the most badass starter pokemon. 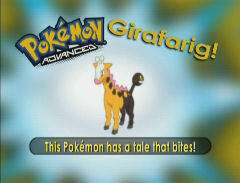 You just KNOW that thing's gonna evolve, and until it does all you can do is sit back and look at its awesomeness. Of course, 4Kids doesn't think Kimori's so great. Apparently we've gone back in time to the year 1996, back when companies like Saban would use those little censor stars to cover hits to the face. However, for some reason the word "die" isn't taboo anymore. The tree doesn't go to the "next dimension" or the "Shadow Realm"--it dies. Sure, we're talking about a tree here as opposed to a person or an animal, but it's still odd to hear the word and all its variants so many times in one episode. In the dub, Ash talks about how when him and Brock and Misty used to travel around, they would get lost all the time. In the Japanese version, he doesn't mention Kasumi by name at all. The word is "tail," not "tale." 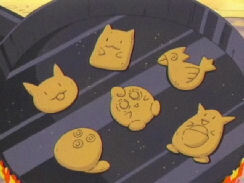 Right after the second commercial break, there's a close-up shot of Takeshi's cookies that was cut. My only guess is that it was cut because one of the cookies looks a little too much like a Chocobo (from the Final Fantasy games) for 4Kids to want to worry about. Either that or they thought cookies were evil since they cause tooth decay and the gum disease gingivitis. The commercial break happened a lot earlier in the dub, so when it came time for the Japanese commercial break, they had the same footage of the bulldozer wreaking havoc repeat itself. 4Kids cut one of the clips of repeated footage. When the Kimori jump up onto the Rocket-Dan's Nyasu balloon and starts whacking the Rocket-Dan around, two edits occur in the dub. Firstly, when Kimori jumps up and whaps Musashi in the face, the actual hit to the face is replaced by one of those full-screen impact star thingees from earlier in the episode. Then, after Kimori breaks the net to free the other Kimori, the Kimori who is soon to be Satoshi's jumps on Kojirou's face, Musashi's face, and Nyasu's face. However, for some reason, the actual hit to Nyasu's face, of all people, is replaced by one of those full-screen impact star thingees (I know what you're gonna say when you click on that image--yes, they did show that frame. 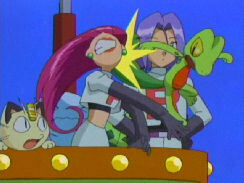 But it was shortened in the dub, and the impact star wasn't there at all in the Japanese version). My guess is that on the second one, they were trying to censor the hit to Musashi's face, but they didn't quite time it right. Y'know how I predicted that the editing out of the gun noises in the previous episode gave me a bad feeling about future episodes? Well, this edit makes me feel even worse. Kimori hits things with its tail CONSTANTLY throughout the series, so I might have a lot of these little censor star things to report in the future. Yeah, the music's been changed. We all knew that. BUT, something very special happens in this episode; there's a vocal song in the Japanese version. During the part where tree is seen growing anew, the song Min'na ga Ita Kara plays in the background. It's from the second movie soundtrack, and it's a really pretty song about calling on one's friends for the strength to keep going. Meanwhile, the dub uses the music I had predicted they'd use. Too bad. In the Japanese version, Pikachu's final attack (the one that finally weakens Kimori enough for Satoshi to capture it) is "Kaminari" (Thunder). In the dub, they call it "Thunderbolt." Oops. The last two seconds of the TO BE CONTINUED screen is cut.